It is my privilege to say a few words on the occasion of my inauguration as the third president of the Japan Neuroblastoma Study Group (JNBSG). The JNBSG was established in May 2006 with the aim of improving the cure rate in children with neuroblastoma in Japan, and to minimize the late effects of certain treatments. Under the strong leadership of the first president, Dr. Michio Kaneko, and the second president, Dr. Hitoshi Ikeda, the JNBSG has steadily laid its foundations with our predecessors’ hard effort and long history. The cure rate of childhood cancer is 70% to 80% in Japan, which is as high as that in Europe and the United States. 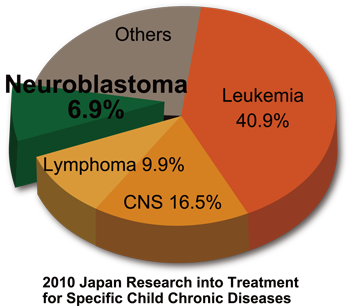 However, the cure rate of high-risk neuroblastoma still remains at a low level of 30% to 40%, which is a big problem. We have also learnt that there is a refractory, extremely high-risk neuroblastoma among the high- risk neuroblastomas. Furthermore, amplification of MYCN (N-myc), an important neuroblastoma oncogene, can no longer be used as a prognostic factor in the high risk group, and we therefore cannot plan any new treatment strategy at present unless we find a new prognostic factor to add to the risk group classification. This type of refractory neuroblastoma is characterized by its similarity to refractory adulthood cancer. We need to develop a new strategy to establish individualized treatment for each child with neuroblastoma. On the other hand, we are facing a challenge to find ways to reduce therapy to minimize the late effects in children with curable neuroblastoma. In addition, we must elucidate the mechanism of carcinogenesis and develop molecular targeted drugs to resolve these challenges. From a wider perspective, international cooperation is essential to develop treatments for this orphan cancer, neuroblastoma, and more and more global collaborative studies on neuroblastoma are being conducted. Two Japanese academic societies of childhood cancer have now merged into one as the Japanese Society of Pediatric Hematology/Oncology, and the Ministry of Health, Labour and Welfare has initiated a project to establish core hospitals for childhood cancer. In concert with this trend, it is important for clinical study groups in Japan to unite. We must work in close cooperation with organizations or individuals who support childhood cancer survivors and their families, and many other supporters to promote the fight against childhood cancer by society as a whole. We, as the new JNBSG, will wholeheartedly make our best effort to save the lives of children with neuroblastoma, not only in Japan, but also worldwide, and will proactively participate in and contribute to the constructive movement that is critical for future medicine and research of childhood cancer in Japan and the rest of the world. Copyright © 2008-2014 JNBSG All Rights Reserved.